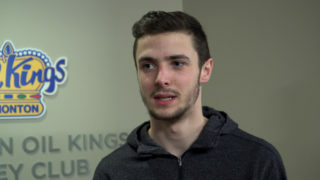 Points in five straight games for the Edmonton Oil Kings is worthy of a huge thumbs up. 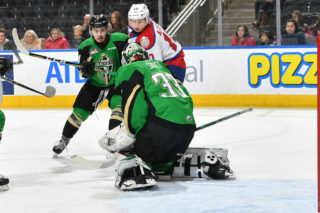 Carter Souch potted a goal and an assist and the Oil Kings’ (25-14-4-4) power play went 2-for-4 as Edmonton claimed the first half of a Battle of Alberta doubleheader at Rogers Place, 3-2, over the Calgary Hitmen (21-18-3-1) in front of a crowd of 8,467. 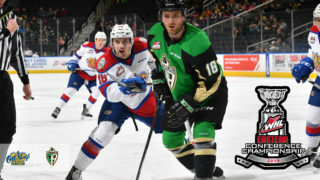 The Oilers and Flames round out the twin bill, which began with the Oil Kings’ game being broadcast nationwide on Rogers Sportsnet as part of the CHL Saturday Showcase. The country got to see the team sport their special Don Cherry-inspired jerseys for the first WHL Suits Up with Don Cherry to Promote Organ Donation campaign in the WHL this season. Vladimir Alistrov snapped a nine-game scoring drought with a goal and an assist; his first goal since the two teams last met on December 28. Matthew Robertson scored in his first home game since returning from injury earlier this week, and Conner McDonald added a pair of assists to reach the 100-regular season point milestone (28G, 72A) in his 235th career regular season game. 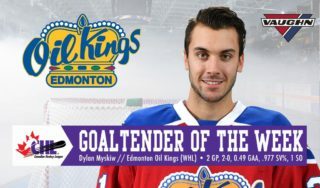 Dylan Myskiw (18-9-2-3) stopped 25 of the 27 shots he faced to earn the win in goal for the Oil Kings. Jack McNaughton (15-11-1-1) took the loss, surrendering three goals on 27 shots in the Hitmen goal. Robertson opened the scoring with his sixth of the season on the power play to make it a 1-0 game, from Alistrov and Liam Keeler, at 7:42 of the first period. 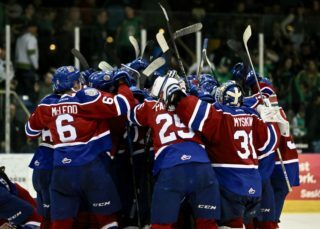 The Oil Kings would take the 1-0 lead into the first intermission while also leading in shots on goal, 12-7. Souch’s eighth of the season made it 2-0 Edmonton and was the second marker with the man advantage, from Josh Williams and McDonald, just 42 seconds into the middle frame. After the Hitmen cut the Oil Kings lead to 2-1 just over six minutes later, Alistrov restored the team’s two-goal lead, 3-1, at 3:51 of the third, from Souch and McDonald. A power play goal by Carson Focht once again narrowed the Edmonton lead to one, but the Oil Kings held on for the regulation win. Calgary was 1-for-4 on the power play while Edmonton finished the night going a 2-for-4 with the man advantage. Conner McDonald (EDM) (3), Mark Kastelic (CGY) (2), and Carter Souch (EDM) (1) were selected as the Three Stars of the Game. 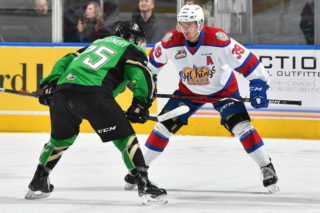 The Oil Kings are back in action on Friday, January 25 when they host the Moose Jaw Warriors at 7:00 PM MT at Rogers Place. Great seats are still available for all Edmonton Oil Kings home games during the 2018-19 season starting at just $20. Visit OilKings.ca for more information or to purchase.